Activate this card by discarding 1 monster, then target 1 monster in your GY whose Level is lower than the discarded monster’s original Level; Special Summon it and equip it with this card. The equipped monster has its effects negated. You can only activate 1 “Overdone Burial” per turn. Much like Premature Burial, Overdone Burial has the classic trappings of possessing the assets and only needing the right partner to be overpowered. Even being once a turn is only a minor hindrance when the right combo comes along. And the reason is the same as any other equip or continuous spell. If it can be bounced, it can one day be abused. I won’t say much more than that. In the current format, this card probably won’t find much use. It could be teched in various decks with multiple levels of monsters such as Kozmo, or any deck that uses equips like Power Tool variants. But it’s not more than that, since it’s a minus, requires a somewhat specific discard cost, and negates the effect of the monster it summons. But I don’t expect this card to stay unutilized forever. Overdone Burial could’ve been something awesome, but it wasn’t to be. Ditch a monster, get a monster from your grave with a lower level, equip this to it, effects negated. The requirement to discard a monster to get a monster of lesser level isn’t too bad, though it would’ve been better had it been “equal or less” for the level. Also, had it included rank. Now onto negation. It is almost never good to have effects negated when you are Special Summoning a monster. You may not have to worry about the monster dying if Overdone Burial is destroyed while equipped, but you still are Special Summoning a vanilla that has to have a lower level than a resource you just discarded. It could be useful for certain decks, but for most it won’t be a card for you to try. Too many cards do the summon from the grave thing that this card does, but without the hoops to jump through. Overdone Burial is an Equip Spell Card, which is inherently bad. The cost to activate this card is a discarded monster, which is bad. You can only use the effect once per turn, which is fine. The monster you Special Summon from the grave has to be of lower level than the cost monster. That’s not too bad, but then the monster’s effects are negated. Also, you’ll never be able to revive monster’s that don’t have a Level. The silver lining is that the monster revived isn’t destroyed when Overdone Burial leaves the field. Also, the effects would come back if any. That being said, the cost is too darn high. Stick with Call of the Haunted. We continue into the number 9 slot of the Top 10 Circuit Break cards with a retrain of a certain Forbidden Spell card, Premature Burial, that keeps the idea of what the banned card did, but does it a bit differently. The name of this card is fitting due to some of these restrictions, Overdone Burial. Overdone Burial is an Equip Spell that must be activated by discarding 1 monster. After that, you target 1 monster in the GY with a level lower than the discarded monster and Special Summon it with the effects negated. If you can unequip this, you can get the effects back because the monster would no longer be equipped and Overdone Burial doesn’t kill the monster. You only get one Overdone Burial per turn to prevent bouncing. Most decks play a ton of low level monsters, so what you can revive is even more limited. Some decks with Boss Monsters can get back their standard monsters, but losing their effects is a massive downside. 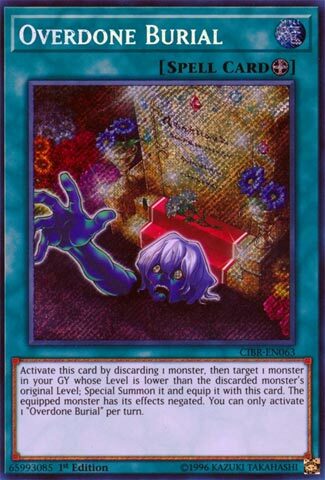 You can use the monster you revive for a material of a Synchro, XYZ, or Link but it would of been nice to have the effects. It is a decent card with potential, but the drawbacks on what you must discard to chose what to revive as well as losing effects, I kinda would of rather this card keep the monster effects but make the monster leave the field when Overdone Burial leaves the field. Overdone Burial…now this card didn’t make my list, and I’ll tell you why. Unlike Premature Burial (which merely requires a cost of 800 Lifepoints) this card is much more a combo card. Can be useful in certain Decks, and useless in others, and there are easier ways to Special Summon Monsters. It’s a -1, as it requires a discard, but the right Deck can make that work (something say like Dark World or Lightsworn, just to name a couple) and other Decks can have fun with this too. It’s kind of a tech card, and yet not, at the same time. I think this card is going to be better later, than it is now. This could be a useful enough card in various Water Decks too, I suppose. But for now, I just don’t see it as anything all that game breaking. This diametrically opposite version has too many restrictions to make it viable for all deck. The discard inherently makes it a -1. Offsetting the discard with a plus without being able to use the monster’s effect is going to be difficult. At worst, if Overdone is responded with a spell/trap removal immediately, the discard is a waste. To make matters worse, the requirement of the discarded monster being a higher level than the revived monster. While I understand the motive to prevent it from being essentially a “Special Summon from hand” card, as well as preventing people from discarding a floater to revive a giant monster, it just makes the card even more restricting and situatonal. This card can be good in situations in which (a) the discarded monster has a useful graveyard effect and (b) the revived monster is a floater which benefits from being sent to the graveyard. If the costs are paid for by floaters, the card can succeed in adding some board pressure and speed. This isn’t a bad card – just a card that could only work in a specific kind of meta.